Mass Effect 2 is a video game. I don't own any of the current gaming platforms. I've never played Mass Effect 1. I do, however, read comic books. The game was just released. Mass Effect 2's advert campaign for comic books consists of a series of single-character-bust, single-word ads, sprinkled in throughout the comic, usually alternating with the pages of actual comic book. 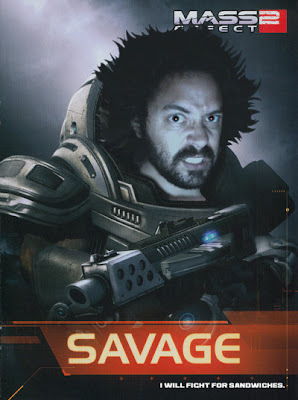 One of the ads features a big brute of a character with the word "Savage" below. Naturally, I had to make this.